In one of his interviews, the great graphic novelist Craig Thompson cites Daniel Clowes as a must-read graphic artist he admires. 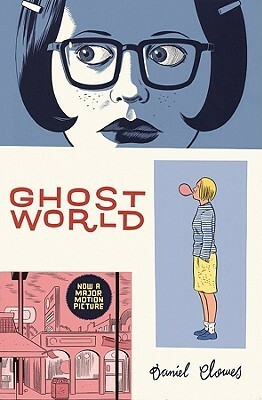 I admire Thompson’s work, so it makes sense I would seek out Clowes. This graphic novel was made into a movie in 2001 starring Thora Birch and Scarlett Johansson. I haven’t seen that yet, but it may well be the first sighting of Scarlett Johansson before big stardom. A GR friend of mine wrote a deeply insightful meditation on the development of American cities in response to this work, going big in the face of adolescent alienation. As much as I enjoyed that piece, the book made a different impression on me. I’m going to go small: this is a novel of ideas that happen internally and out of sight. All we see is the petulance, the ripple on the surface of a psyche. A young thin blond girl and a much edgier dark-haired friend who sports an aggressive haircut and heavy-framed glasses are nearing the end of high school. Contemplating their futures, the dark-haired girl wishes to become someone else. “I totally hate myself,” she cries late one night lying on the couch of a boy she’d just admitted she loved. Poor guy. At that age we are both afraid of and jealous of the complexities adults wrestle every day; we want to try out our problem-handling skills to see if they can measure up. We want the next thing to happen so that we are not merely sitting ducks when it does. Desire for the world and fear of that same world mix unsteadily in our gut. We’re not ready, but when will we ever be? The ideas shown in this graphic novel struck me as completely within the range of 'normal' adolescent angst, disaffection, confusion, and fear about the world and one’s role in it. We’re pretty obnoxious and self-absorbed at that age, as anyone with a teenager in the house will readily commiserate. Clowes actually plays it so low key we are as bored and unimpressed with their lives as the characters are. The tricolor palette in this book works fine: black and white with a green wash. The pen drawings capture the sprawled-leg teenager-y postures, the trying-so-hard-to-be-cooler-than-thou clothing choices and the deliciously descriptive backgrounds absolutely fill in the picture. I thought Clowes was brave to take on the persona of a teenaged girl, but he caught that moment in the lifecycle of a female of the species perfectly. This is another example, if we needed one, that the writing—including what isn’t said—is as important as the drawing in great graphic novels. So many things have to come together to make a great and lasting work. I admire the heck out of artists working in this medium and encourage anyone who hasn’t picked up a graphic novel lately to try one. It’s hard to read just one.